Iron meteorites, with few exceptions,* represent fragments from the cores of large differentiated bodies (for an explanation of differentiation, see the "achondrites" page). Irons are remarkably rare. Since irons account for 8-10% of meteorites found (excluding those from Antarctica or the hot deserts of Africa and the Middle East), and they're usually larger than stones, they have typically been viewed as relatively common meteorites. But, in places where people have systematically searched for meteorites (Antarctica, Northwest Africa, Oman), irons acount for a mere 1-2% of finds. If witnessed falls are taken into account, irons are much less common than HED's and most other meteorite types. They're unusual, they're visually stunning, and they tend to withstand both weathering and ablation much better than stones do, resulting in meteorites with very aesthetic shapes. A new 203 gram oriented iron meteorite from Northwest Africa. In addition to the radial flow-lines, note the semi-parallel impact scars on the right side of the specimen. Obverse, same specimen as above. Perhaps the most interesting thing about iron meteorites is that most of them display a remarkable internal crystalline structure most often called a 'Widmanstatten pattern,' or 'Thomson structure' -- most people refer to it with the former name, but Thomson's discovery of the structure predated Widmanstatten's by a few years. This is an example of the Thomson Structure in a new fine octahedrite from Northwest Africa. "Fine" describes the relatively narrow width of the crystals visible in the photo. 1) The starting material is molten Fe-Ni mixture. 2) This mixture solidifies at ~1500°C and starts out in a particular atomic arrangement called taenite. 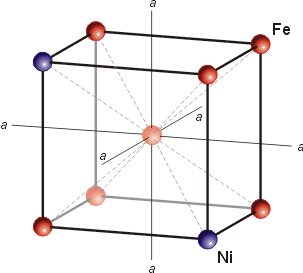 3) Between 1500° and ~723° the solid Fe-Ni mixture slowly rearranges itself atomically to a different structure called kamacite (the amount that changes depends on the amount of Ni present in the mixture as well as the cooling rate and impurities that facilitate nucleation and growth). 4) After it cools beyond ~723°, the atoms lack the kinetic energy needed to rearrange themselves and the pattern stops forming. The key thing to note is that step three needs to occur over, at the very least, tens or hundreds of million years in order to give the atoms in the mixture enough time to rearange themselves into the new crystal structure. 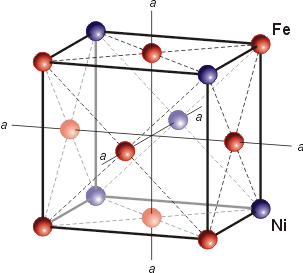 The cooling rate of the solid Fe-Ni mixture must be at most tens or hundreds of degress per million years in order for a Thomson structure to form. So, what do you see when looking at a cut and etched iron? Most meteorite-enthusiasts would tell you that what you're seeing is an intergrowth of kamacite and taenite. That's half true. 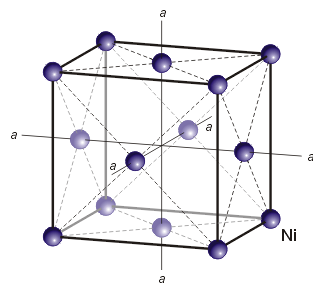 The octahedral structure that is seen in most iron meteorites forms because the kamacite preferentially nucleates and grows along the taenite's octahedral crystal boundaries. They don't "grow together;" the kamacite grows at the expense of the taenite. And, usually, the vast majority of what you're seeing is kamacite. Usually. High-nickel meteorites (e.g. most ataxites) are made entirely of taenite. If you're interested in what exactly goes on in the process, I've attached a copy of a paper I wrote in sophomore year for a mineralogy class about the finer details of what went on inside these meteorites. 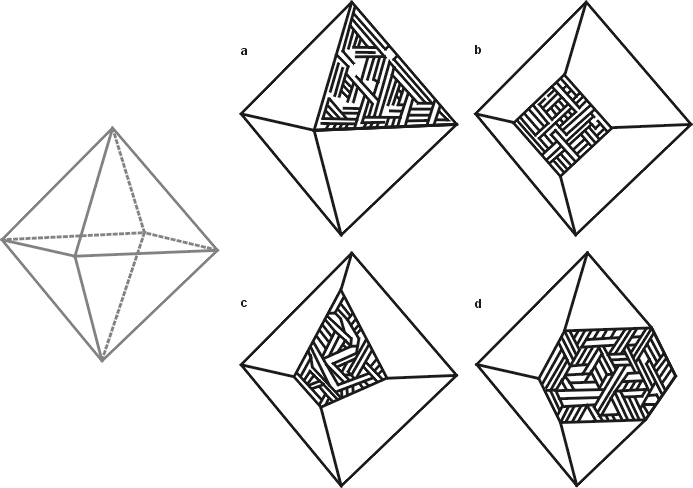 See the link "Download: Thomson Structure Formation" for the download. It should be the bottom link on the left-hand column. A disclaimer -- it's pretty rough, and I'm sure more recent work paints a much more accurate picture of how these processes actually take place. That said, it gives a fair idea of what basically went on inside these meteorites as they cooled. Available specimens are listed on the left-hand side (but watch out -- the bottom link is the download on the formation of Thomson Structures).